With Tel Aviv’s historic Old City of Jaffa getting its third new luxury hotel this year, we’d venture that the destination is about to be on your radar in a very big way—three’s a trend, after all. When the Jaffa welcomes its first guests on August 20 as part of Marriott’s Luxury Collection Hotels & Resorts, it will join the recently opened Setai Tel Aviv and the Drisco in bringing deluxe accommodations to the 4,000-year-old city. And with 120 rooms and suites, 32 luxury residences, two restaurants run by New York’s lauded Major Food Group, and an L. Raphael Beauty Spa, it makes a strong bid as the crown jewel of the suddenly buzzing neighborhood. The property is the passion project of Aby Rosen, founder of the New York RFR Holding, the hotel and real estate company behind landmarks like 11 Howard, the Seagram Building, the Lever House, and the Gramercy Park Hotel in New York City and W South Beach in Miami. 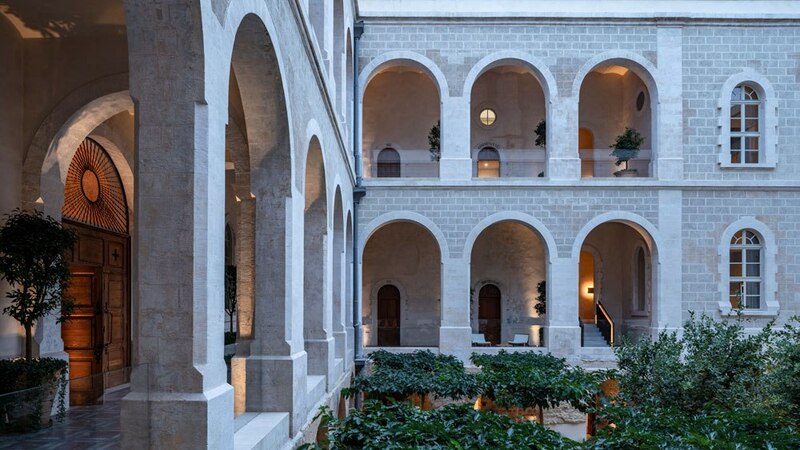 And what a project it was—the company’s first Israel hotel is the culmination of a decade-long restoration and transformation of a landmark 19th-century former French hospital and monastery. RFR tapped local conservationist architect Ramy Gill and British designer John Pawson to lead the reinvention and redesign of the neoclassical U-shaped building, which maintains its raw surfaces and existing facade, including outdoor corridors with arched colonnades. The two also oversaw the adjacent new build, which houses 32 residences and a modern lobby. But even here, old and new artfully coalesce, with remnants of a 13th-century Crusader’s bastion wall uncovered during the hotel’s excavation displayed alongside two Damien Hirst paintings and two George Condo busts. Both buildings encircle a lush, secluded courtyard where guests can while away hot afternoons nestled under a canopy of trees. Featuring panoramic views of Jaffa, the Mediterranean Sea, and the courtyard below, rooms have private balconies, custom-designed furnishings (suites feature seating by design giants Pierre Paulin and Hans Wegner), and luxe finishes. Pawson, inspired by the travertine used throughout the hotel, turned the material into a carpet design by taking a photo of the stone and digitally stretching it to create the pattern. Contemporary photography by Israeli artist Tal Shochat is on display in all rooms, providing a modern touch to the ancient walls. When the property opens, amenities will include a sundeck equipped with an outdoor pool and bar, a state-of-the-art fitness center, and a Shesh Besh backgammon lounge in the lobby, complete with bespoke backgammon tables designed by Pawson. The magnificent L. Raphael Beauty Spa will come online in September, offering a menu that includes the brand’s famous Oxy Anti-Aging, Anti-Cellulite, and Tightening and Beauty Diamond treatments as well as locally inspired signature treatments like “Secrets of the Dead Sea” Tightening and Toning Body Treatment and Dead Sea Detoxifying Body Polish. Topping the space off are four separate saunas. The hotel’s signature restaurants—operated by New York’s Major Food Group (of Carbone, the Grill, and Sadelle’s fame) in collaboration with local chef Roi Antebi—don’t disappoint in Tel Aviv’s burgeoning culinary scene. Already open, Don Camillo—a classic Italian restaurant with a Mediterranean twist—features dishes like Yellowtail Jaffa, Tortellini al Ragu, spicy Pollo Diavolo, and desserts by pastry chef Tal Hoenig as well as more than 3,000 wines curated by local sommelier Gal Zohar. Golda’s Deli brings authentic New York to Israel, serving classics like bagels and lox, tuna melts, and double-decker sandwiches. 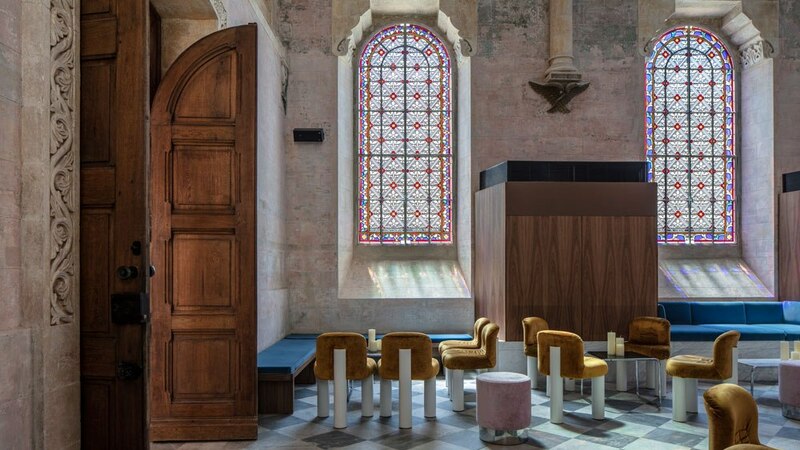 Though all of this is more than enough to make an impression, possibly the most distinctive spot at the Jaffa is its Chapel Bar and Lounge—painstakingly restored from its days as an actual chapel, when it served the School of the Sisterhood of St. Joseph. The striking room features nods to its heritage with recessed stained-glass windows, arched ceilings, and ornate plasterwork details—though it now functions as an event space and hip nightclub. This is still Tel Aviv, after all.